Would you like to contribute an article to All About Appliqué? Come on down! You can show us a special tip or trick, give us a photo tour of your method, demo a product, review your favorite book, etc. etc. Any method of appliqué is great! Use anybody’s pattern, or your own, just be sure to give the pattern source. 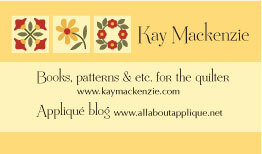 Shoot me an email to kay at kaymackenzie.com (you know the drill, use the @ sign and no spaces) and let me know what you have in mind. Don’t worry, you don’t have to know how to blog! If you can write an email and attach a photo, you can do this! I’ll turn your material into a fantastic post. That’s the way a fantastic tea-themed blog post starts out, over at Quilt Inspiration! Find out why Eleanor Roosevelt thought so in this comprehensive article all about tea, teapot quilts, and teapot fabrics. 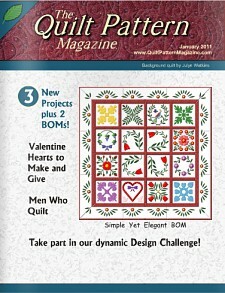 Quilt Inspiration is written by Marina and Daryl, a team of quilt lovers and “idea collectors.” There are many other fascinating themed articles as well on their exceedingly nice blog, so fix a cup of tea and relax awhile. Before Christmas, I received a note from Maribeth Keane, Associate Editor of The Collectors Weekly. Maribeth describes this online publication, based in San Francisco, as a resource for anyone interested in antiques, vintage, and collecting. 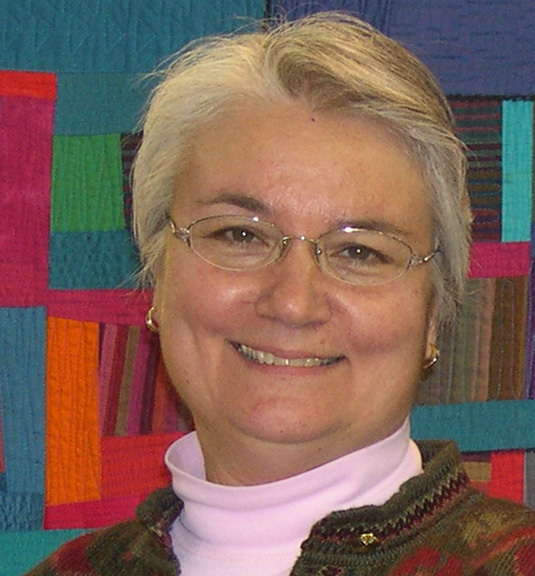 Maribeth contacted me to let me know that The Collectors Weekly ran an interview with esteemed quilt historian Merikay Waldvogel. Merikay is a friend of a friend of mine, as is Barbara Brackman, and Bets Ramsey is an old family friend of my husband’s stepmother! Barbara and Bets both figure in the article as well. Being an internet publication lends the luxury of very comprehensive interviews, and this one (in two parts) is a fabulous in-depth journey into the history of American quiltmaking. 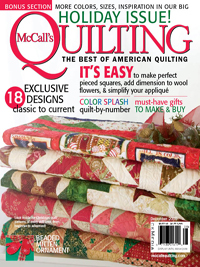 I just got a note from reader Robin that she was leafing through the latest issue of McCall’s Quilting, and found my quilt! On page 36 to be exact! Wow, it must be October already. That’s when I thought the December issue was due out. My copy of the magazine hasn’t arrived yet and now I’m dying to see it! This was the assignment that I wrote about back in May, when Gregory Case introduced me to editor Beth Hayes in the aisle during Spring Market. Beth is a wonderfully gracious and warm person and I was very lucky to meet her in this fashion. They put a sneak peak of the project on the McCalls Quilting website. In the magazine, the project is accompanied by a photo tutorial on back-basting. Has anybody else seen the article?? When Froncie Quinn moved to Vermont she discovered the Shelburne Museum and its collection of antique quilts. She approached the museum about patterning the quilts so that modern quilters could reproduce and enjoy them more fully. The Shelburne agreed and now Froncie offers several collections of museum-licensed patterns featuring the designs of yesteryear. Check out her website, Hoopla Patterns. There are many great patterns, links to historical articles written by Froncie, and reproduction fabrics based on the old quilts that she has studied in the museums. A fantastic homage to our quilting heritage. They came as a package deal, 18 years ago when we lived in Ohio. Three little stray kittens, presumably littermates, who followed us home and never left. Then they were California kitties, growing old in the sunlight, lumping along and enjoying the climate. So I’ve a lot of experience living with a triple load of cat hair. Over the years I’ve tried different strategies for coping with the issue of cat hair vs. the quilt. Here are my best recommendations for a happy medium (or, as in Pixel’s case, large and round). A. Keep the cats out of the sewing room. Yeah right. If you’re like me and have stuff stationed in front of the door so that it can’t ever close, go to Plans B, C, D, etc. B. Vacuum regularly. I had to say that. Now directly to Plans C, D, E, etc. 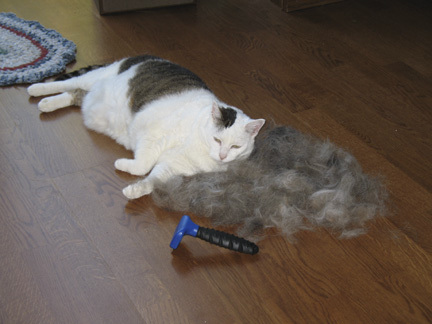 C. Brush or comb the cats daily. This falls under the category of New Year’s Resolution. For the past eighteen years. D. Don’t throw your scraps into a box. This becomes a prime destination for cats, and when you’re going to a strip poker party and start rummaging for strips, you’ll be too embarrassed to throw them into the pot. Also, it’s a good way to sew a lot of cat hair into your scrap quilts. E. Do create the best place for a cat to be. Set up a special place for them under a sunny window, or the closest equivalent, so that when the cats do come into the studio, they head for their spot. This strategy keeps the cat hair concentrated in one place. F. Keep a box of Swiffers on hand at all times. That way, when the mood strikes you (or the sun strikes a cat hair-covered surface in brilliant illumination), you can readily wipe down whatever small areas are accessible amongst the quilting supplies. G. Buy industrial-sized lint roller refills by the dozen. Beware of non-refillable handles, and don’t fall for the rinseable lint rollers. What happens is, you get up a soupçon of cat hair, the roller is full, you rinse it, and… you’ve got a wet lint roller. H. Roller your quilts each and every time you take them out of the house. Even if they have been covered by a sheet the whole time. Cat hair finds a way. Fold them in quarters and roller each quarter, front and back. Pay special attention to the bindings. If you’re sending them to a show, do this compulsively several times, with your glasses on, in good light. I. If you’re taking a friend’s quilts to a show, make sure they are delivered to your house in a hermetically sealed plastic bag, and resist all temptation to take them out for a peek. J. If selling a quilt, provide a warning for those allergic to cats. Refer to the above truth, “cat hair finds a way.” Let’s just say, we don’t want to hear the words “quilt” and “anaphylactic shock” in the same sentence. K. Keep tweezers nearby. These are handy for removing individual cat hairs in mid-appliqué, either by hand or machine. L. When looking for dropped items, take advantage of the opportunity whilst down on your hand and knees to remove the cat-hair bunnies from around the legs of the sewing table. You’ll also find several seam rippers and half of your supply of pins. M. Hire a housekeeper! This heaven-sent person swoops in and removes a large percentage of the cat hair patina, as well as stray threads, fabric orts, and scraps of freezer paper. Notice that nowhere does the advice appear to eighty-six the cats. My husband Dana once made up a little saying that goes something like this: “The next best thing to cats is quilts. The best thing next to quilts is cats.” Animals love comfort and texture. Make your cats (and dogs) their own quilt. Sew something together that’s quick and fun, and practice your machine quilting on it. I promise you they will consider it the most excellent of all quilts. Art quilter Laura Wasilowski of Elgin, Illinois, is a founding member of the Chicago School of Fusing. In fact, she’s the Dean of Corrections. Laura: The mission of the Chicago School of Fusing is to encourage the technique of fusing to create art work. We know that it is the quickest way to get from that idea in your head to the implementation of that idea in fabric. Fusing gives you endless possibilities for making art. Kay: Were you always a confirmed fuser? Laura: No, I started out as a piecer as a teenager but as an adult I wanted to make pictorial art. Fusing allowed me to make those organic shapes so important in picture making. Kay: The readers are going to want to know what’s your favorite kind of fusible web. Laura: I use paper-backed Wonder Under #805 (regular weight). The release paper that comes with it is so important in creating fused art quilts. You can use the paper for collage building, pattern transfer, protecting the quilt top, and storing fused elements or large fused shapes. It always releases a fused fabric. Kay: You prefer to use hand-dyed fabric, yes? You dye your own and also offer it in your Artfabrik store. Tell us why these types of fabrics are better for the fused quilts. Laura: A hand-dyed or batik fabric works best for these raw-edged fused applique quilts. First, there is no finish on these fabrics so they will adhere better (but wash out the starch in a batik fabric). Most importantly, the color penetrates all the way through hand-dyed and batik fabrics so the edges of fabric elements show the color. A printed fabric will have a white background and you will see that white edge around each cut element. Kay: You also offer beautiful hand-dyed thread. How can it be used? Laura: I love hand embroidery with my hand-dyed threads. It adds that extra hit of color, texture, detail, or pattern to the surface that cannot be done with fabric. It draws the viewer closer and brings the quilt to life. These threads can be used for any of the needle arts — crochet, knitting, weaving, needle punch, needle point, couching, machine quilting, and bobbin work. Kay: How do you finish the edges of the motifs in your quilts? Laura: They are not finished. Steam-setting the glue keeps the fabric permanently adhered to the other fabrics and batting. Kay: How do you quilt them? Laura: I first stitch by hand through just the batting and top layer. Then I free-motion machine quilt through all the layers. My Janome 6500 is a work horse and does beautiful free-motion work. Kay: You’ve authored two books and a DVD. Tell us a little bit about each one. 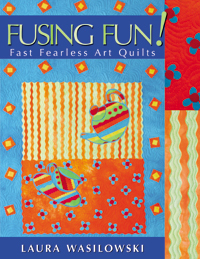 Laura: My first book, Fusing Fun: Fast Fearless Art Quilts, is a great book for new fusing enthusiasts who want to learn as much as they can about the fine art of fusing. There are six projects with variations, basic fusing terms and instruction, a section of binding and display, and a gallery of fused art work by other artists. 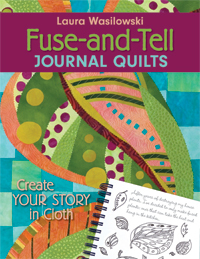 Fuse and Tell Journal Quilts shows readers how to translate their stories or ideas into fabric. From sketches, to photos, to design triggers, each of the six projects helps you make the quilt in the book and tells you how to make your art work using those techniques. The wrapped binding is introduced along with tips on bias fusing, working with cheesecloth, and improvisational design. 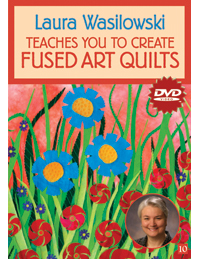 The DVD, Laura Wasilowski Teaches You to Create Fused Art Quilts, has a project from start to finish, a tour of my sewing and dye studios, and a gallery of quilts with commentary. And as the Dean of Corrections I go over the rules of fusing from the Chicago School of Fusing. I also sing the fight song sung by the Iron Maidens as they go into battle. Kay: You’ve been on Simply Quilts and on The Quilt Show. Were those fun? Laura: Yes, the hosts and crew made it really easy and inviting. As a ham, it was right up my alley! It was also an opportunity for me to hone my teaching skills and to be able to articulate what I do in a short amount of time. Kay: I hear you’ve become a Serial Quilter. Tell us about this process. Laura: I have a tendency to work in a series. I’ll take a theme and make quilt after quilt based upon that idea. 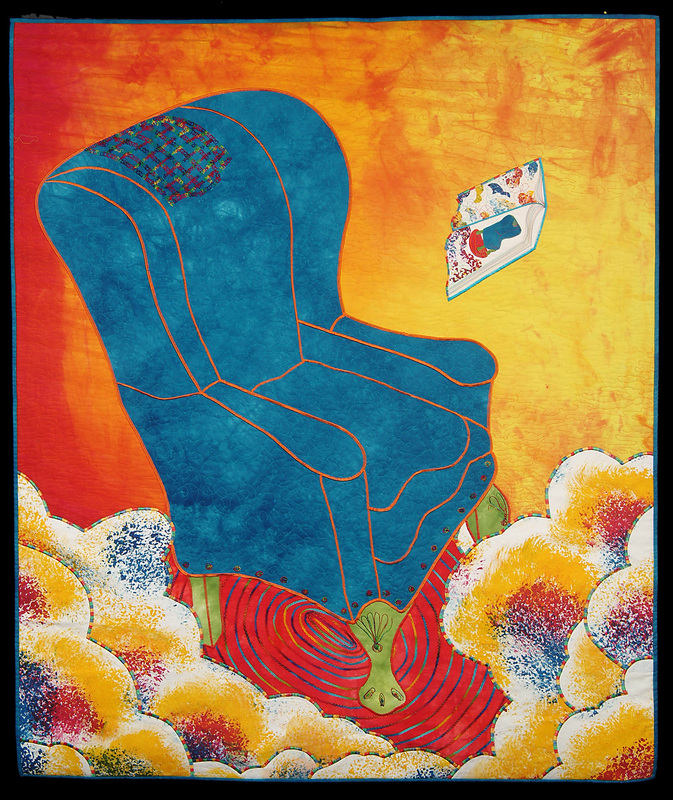 For instance, in the blue chair series I have my blue chair reading a book, putting its feet up, down at the beach, and plugged in (the Blue Electric Chair). This way I only have to come up with one idea and can make many versions of it before moving on to the next idea. Kay: You travel a lot for workshops and lectures. How do you enjoy this lifestyle? Laura: I enjoy meeting new people and seeing new parts of the world. The airports I could live without, but it’s part of my job. Kay: What are you working on now? Laura: Hand-stitched small quilts (see Betty’s Bloomers #13, above), new patterns, dyeing fabric and thread, preparing for workshops and vending, and keeping my head above water until December when my teaching season ends and I collapse into a puddle of colorful water on the floor. Kay: You’re a bit of a songbird. Would you care to leave us with the lyrics of one of your compositions? She exercised often and ate lots of soy. They found her there clutching her sewing machine. Thank you, Laura, for that inspirational ditty, and for visiting All About Appliqué. I publish it for you here, because I think it’s quite an interesting proposition. This was before I learned back-basting. For quite a long time I was a hand appliquér only. But when I started designing appliqué patterns for publication, I turned to machine appliqué as a speedier way of creating second and third examples of the designs. After all, machine appliqué is a lot faster, right? Somewhere along the way I became curious about how much time I was actually saving. I decided to conduct a personal timed study to compare a hand method and a machine method. I used a block from A Spin in the Garden, a pattern I was designing. is the one I used. Raw edge, small machine blanket stitch using paper-backed fusible web and a tracing-paper placement overlay. I used the same block and the same fabrics for both methods. I did not time the initial steps that were common to both methods, including selecting fabrics, cutting background squares, finding my glasses, gathering all materials, supplies, and notions, numbering the shapes in placement sequence, and assigning the colors on the pattern. After organizing my thoughts and the projects, I set to work, watching the clock and recording the time for each step. I did one method all the way through, then the other. Here are my results. Click either block for a close-up. It was interesting to note that the pre-stitching phase took longer for machine appliqué than for hand appliqué. Cutting out the centers of the fusible web templates is not applicable for freezer-paper templates, and ironing time for fusible web templates is longer than for freezer-paper templates. For hand appliqué, I didn’t need to set up my machine, and I could trace the overlay quickly and with less care, since it was for placement purposes only. The time savings for machine appliqué showed up in the last stage, where the shapes were placed, secured, and stitched. The grand total difference in time represented about a 30% overall time savings for machine appliqué. There’s a lot to think about when looking at these time results. You may be faster or slower at any of these steps than I am. There are many ways to appliqué, and you may use differing techniques that are slower or faster within either hand or machine methods. Time, of course, is not the only factor for choosing one method over another. Personal enjoyment, skill level, preference for appearance, portability, appropriateness for the chosen project, type of sewing machine, these things and more can come into play when choosing an appliqué method. I’m so glad I decided to conduct this personal timed study. Now I have learned that when either method is equally appropriate for my project, and time is the deciding factor, I’ll be saving almost a third by using machine appliqué. I’d love to hear what you think about this! Did I save as much time as you thought I would? 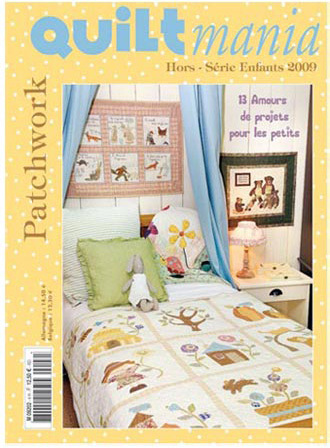 I’m busting with pride over my pal Holly Mabutas, whose darling quilt ‘Home in the Middle’ made the cover of the French magazine Quiltmania. Go to Holly’s blog Sprinkles of Thought to read her account. Way to go Holly! While you’re there, be sure to look at another of Holly’s creations, Fresh Picked, which has to be one of the most adorable things ever. The blog also has a series of fascinating articles about fabric design, as Holly goes through formal school learning all about it. I’ve written before about the American Patchwork & Quilting site, AllPeopleQuilt.com, being a good resource for appliqué info. I just surfed over there again and found a glorious wealth of appliqué information, from patterns to videos to tips and tricks, etc. 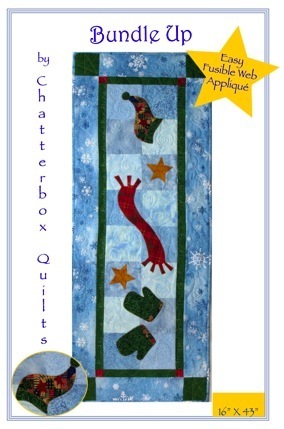 Here’s the link to their appliqué section. When I was on the homepage I clicked on one of their most popular searches, “Flower Appliqué Quilts” and it brought up 22 darling appliqué patterns with flowers in them. Some of these patterns are for purchase and download, but a lot of them are free! I was so happy to see in the January 2009 issue of American Quilter magazine that the top winners of the huge 2008 Des Moines Quilt Expo were gorgeous appliqué quilts! Appliqué took Best of Show, Best Hand Workmanship, and Best Machine Workmanship. 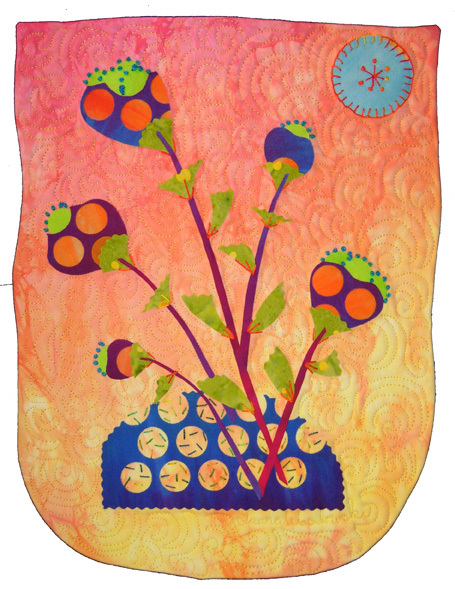 Appliqué was an ingredient in all three winners in the Bed Quilts-Traditional category, and in two of the three winners in Wall Quilts-Traditional. I went to the AQS website to see if they had posted photos. Guess what… they’re already down! Hey guys, leave ’em up a little longer how ’bout it? But I found this cached page where you can still enjoy them. One of my appliqué idols, Jeana Kimball, has written a very thoughtful piece on traditional hand appliqué in today’s quilt-show climate. Jeana’s website is Jeana Kimball’s Foxglove Cottage (be sure to check out her books and patterns) and here’s the link to the article on her Sewing Room blog. 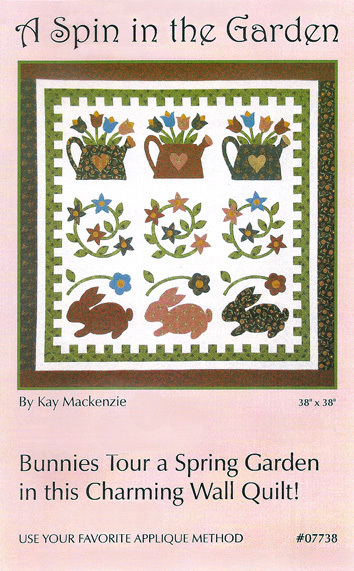 The November 2008 issue of American Quilter magazine, put out by the American Quilters Society, features “Appliqué Your Way” … yay! Not only is this issue full of great appliqué information, there’s a bagful of eye candy in the form of the winners of the recent Nashville show. Best of Show and Best Hand Workmanship Award both went to Baltimore Album-style quilts :). The celebration continues in the next issue with Jeana Kimball’s back-basting technique. Jeana is one of my all-time favorite appliqué idols and I can’t wait to see this article. The newsletter that is. 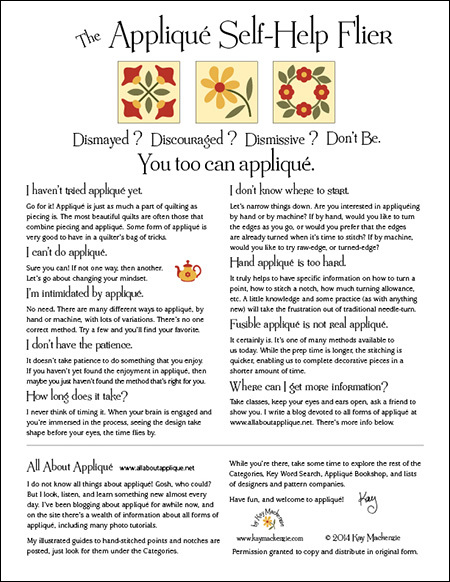 I just got the September/October issue of The Appliqué Society newsletter and there I am! A few months ago I responded to a plea for more patterns to go in the newsletters for TAS members to use and enjoy. I sent them a pattern and was delighted to learn that they also like to put in a short feature about the designer when the pattern goes in. In addition, Patti noticed that I do my illustration on the computer and asked if I would like to write a piece about the possibilities for using digital illustration to draw appliqué patterns. Would I! I jumped at the chance. I love a good rousing discussion of vector graphics. My article “Designing on the Computer” also appears in the newsletter.